Yowza! I never knew that you were such a versatile all around great cook, Gary. That looks like one awesome recipe. What are the possibilities of grilling s.s. crabs on either direct or indirect heat? Already the second week of June and I hadn't made my my famous pan fried soft shell crab with lime sauce. Oh, ok, it's actually Revrend Andy's recipe, but as I have been using the recipe for 10+ years I tend to think of it as mine. It's a deceptively simple recipe, though the use of lime juice and zest really amp up the flavor. On Tuesday I knew I would be in the vicinity of Dirk's, my current favorite fish store, thanks MAG, so I canceled our usual Tuesday dinner reservation at Romano's Macaroni Grill and made soft shells. Dirk's was, as usual, right on the ball, beautiful, fairly priced, soft shells, gratis lemons and bags of ice for my cooler, all around friendly efficient service. The recipe calls for the zest of one lime, which I usually grate on my 10-year-old box grater, but this time I decided to use my 'new' microplane grater. I say 'new' as I have had it for months, but am such a creature of habit I never bothered to use the microplane. Oh my, I never knew what I was missing, I should have bought one of these years ago. With a salad of tomato/red onion/radish, and side of rice, dinner was not only delicious, but quick and easy. The bonus was we had one crab left over, on which I had designs for a sandwich, but my darling wife beat me to the punch. Coat crab with flour mixed with cajun seasoning and shake off excess. Saute in butter 4 minutes first side and 3 minutes other side. Keep warm. Add lime rind and juice and water to pan. Scrape brown particles in pan and incorporate in lime. Reduce till thick. If necessary, add more water and seasoned flour. Season with salt and pepper to taste. Last edited by G Wiv on June 1st, 2007, 11:07 pm, edited 1 time in total. YourPalWill wrote: Yowza! I never knew that you were such a versatile all around great cook, Gary. That looks like one awesome recipe. It is a great recipe, did I mention it was my own invention? Oh, ok, as I said it's Andy's, but he's moving soon and then it will be... oh right, that soft shell recipe is mine. Last edited by G Wiv on June 13th, 2004, 1:21 am, edited 1 time in total. 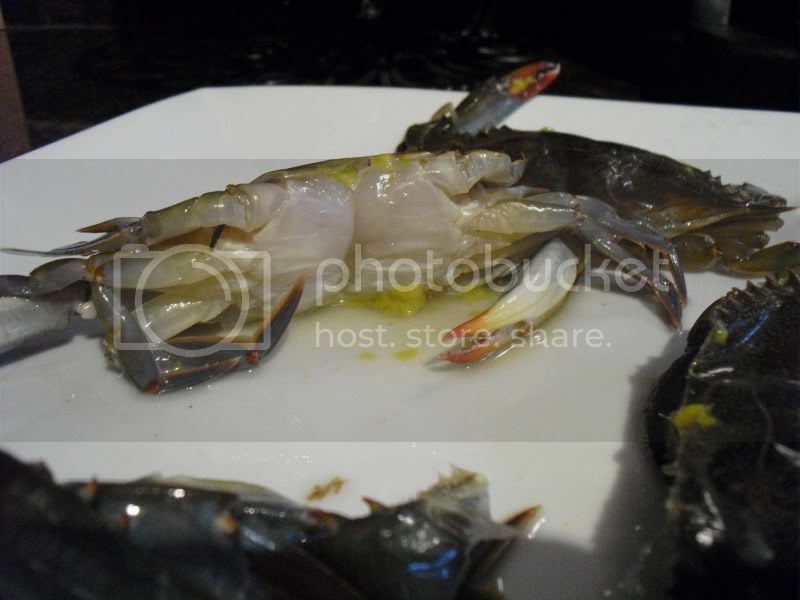 I've grilled soft shell crab a few times, works ok with a hot fire and a lightly oiled crab, but dusted with flour and sauteed is, by far my favorite preparation. I tried indirect smoking soft shells once, and once was more than enough. The soft shell crab seemed to act like a smoke sponge, way over smoked, and the shell became quite rubbery. I saw this post on Friday and picked up 6 soft shells from Dirk's after work and made G Wiv's recipe. They were delicious--thank you G Wiv! I served them with plain jasmine rice to soak up the sauce. However, the crabs were a little bit "squirty". I've eaten them frequently in restaurants but never made them before. Should I have pressed them down while they were sauteeing? I had Dirk's clean them for me and was told not to rinse them before I cooked them so I didn't add any water to them. They were still delicious though but the squirt was a bit of a surprise. The squirt's the best part! I wouldn't press down on them while cooking b/c you'll lose some of the juicy, good stuff. Whisk all tartar sauce ingredients together and refrigerate. Melt butter in a small sauce pan and cook the garlic, shallot and Old Bay until the “rawness” of the onion and garlic has mellowed, and they’re soft and translucent (but NOT brown). Butter rolls on both sides and grill. Slap 2 softshells on bun, top with lettuce, tomato and a dollop of the tartar sauce. Eat. Drink a beer. Love life. 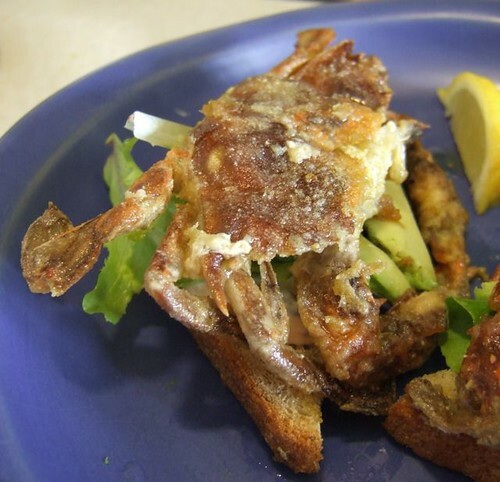 Crrush is absolutely correct in saying that the squirt's the best part of the soft shell crab. And you absolutely do not want to press down on soft crabs with your tongs or spatula. I also commend Dirk's for giving the excellent advice not to wash the crabs. (Cal Ripken would never do that!!) That would be akin to rinsing a freshly shucked oyster under a spigot in order to remove shell particles, which unbelievably, I've seen many a trained culinarian do. That squirt is known as the crab's "mustard" down in the Tidewater, Virginia area, where I was born and raised, and it is a true delicacy. Next week, when I'm down in Norfolk, I'll be slurping down that mustard nonstop from steamed blue crabs, and washing it down with ice cold Natty Bo. This past 4th of July, G Wiv, Bruce and Mary Cook, The Lovely Donna and myself spent part of our afternoon digging the mustard out of "Little" Three Happiness' delectable Dry Fried Crabs, which I have to say were extra tasty that day, maybe even better than the snails in black bean sauce. Don't be surprised if I show up over at your house the next time you're grillin' up a mess o' crabs. My brother called me last night from Winchester VA, whence he had returned from a week at MIL's place in Ocean City. He said the blue crabs were fatter and sweeter than he'd ever seen them before. Also more expensive. BTW, if you ever get by Bridgeville DE on a weekend, the Lion's Club there has a booth on the south side of town, where they sell the very best oyster club sandwich I've ever had in my life--including some awfully good ones in NOLA. Take some crab pix, ok?! Rudy wrote: They were still delicious though but the squirt was a bit of a surprise. Simply means they were very fresh, you cooked them properly, ie didn't futz (poke/prod/flip 19-times) with them in the pan and they liked you. Crrush's soft shell sandwiches look terrific, especially the amped up tarter sauce. Going to try that next time out. A few times when biting into salt and pepper head-on shrimp there has been a tremendous squirt. Once so strong it the juices hit someone on the other side of the table. Wouldn't these be considered the equivalent to the crab's mustard? We caught about a bushel of blue crabs over the course of five days, which isn't a lot for the amount of effort that actually goes into baiting and pulling crab pots as often as we did. The stinging nettles/jellyfish were a huge problem this year, for some reason. But the end result was worth it: I've got about a pound and a half of picked crab meat in the freezer, waiting for that special crab recipe to inspire me. I remember a thread about a Wolfgang Puck crabcake recipe...some long, overly involved business. Anyone have suggestions? Thanks for all of the feedback. The squirt was delicious. I think the crabs I've eaten out at restaurants may have not been as fresh or were simply overcooked. I'm going on a mission with softshells for the next couple of months and I'm definitely going to try Crrush's recipe. Thanks again! crrush wrote: We caught about a bushel of blue crabs over the course of five days, which isn't a lot for the amount of effort that actually goes into baiting and pulling crab pots as often as we did. The stinging nettles/jellyfish were a huge problem this year, for some reason. But the end result was worth it: I've got about a pound and a half of picked crab meat in the freezer, waiting for that special crab recipe to inspire me. Spread the remaining cracker crumbs in a pie pan. Divide the crab meat mixture with your hands into 6 portions, make 6 round balls, then flatten the balls into fat cakes, about 4 inches wide and 1 inch thick. Handle the mixture as little as possible to keep it light-textured. Turn each cake carefully in the cracker crumbs to coat, place the cakes on a plate or tray, and return them to the freezer for 15-30 minutes (or refrigerate for a few hours) until the cakes are very cold. In a large, nonstick frying pan, heat the oil, add the cakes, and sauté on each side for 2-3 minutes or until lightly browned, using a wide spatula to turn them carefully and gently. Place the browned cakes on a baking sheet and bake in a preheated 375º oven for 8 minutes. Turn the cakes carefully and back for another 6 minutes, or until they are completely hot. Serve with lemon wedges and, if you wish, tartar sauce of salsa. Serves 6. *The original recipe uses mayonnaise as a binder. The egg binds better, but gives the crab a yellow color which disguises the beautiful white color of the crabmeat. Try it both ways. June 1 seems the perfect day for soft shell crab, but then again what day isn't, so after a fulfilling Navajo Fry Bread Taco lunch I headed over to Dirk's for still kicking and twitching soft shells, which were a reasonable (for Chicago) $5 per. In addition to his usual stellar selection of things seafood Dirk had fresh wasabi root. The wasabi is $80 per lb, the piece Dirk is holding was $11. Dirk's current stock of wasabi root is from China and I found the flavor different from Japanese or Oregon fresh wasabi I have had which, admittedly, has not been often. 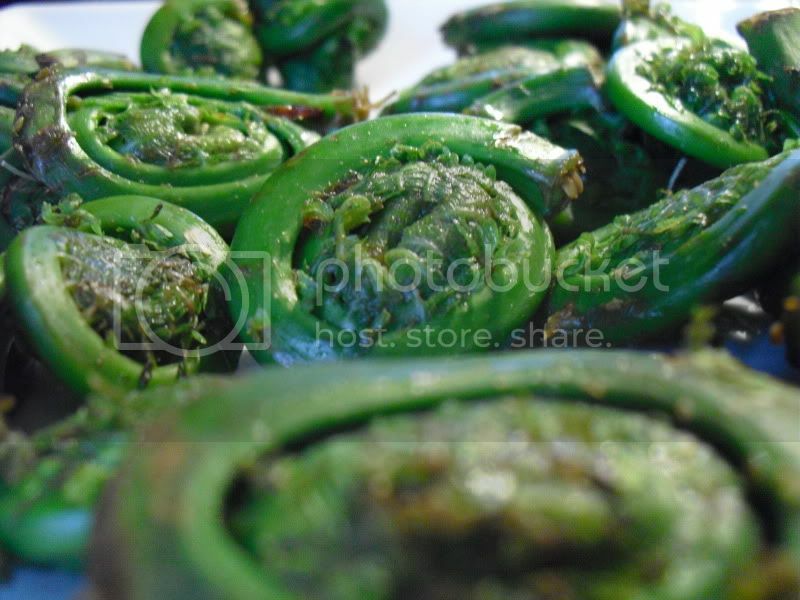 The Chinese wasabi hits you with a blast of sharp bite right up front, then dissipates quickly with a subtext of earthy, vegetal flavor, reminiscent of burdock root or carrot. Dirk thought salsify. I've been using the same recipe, courtesy of RevrendAndy, for years, relatively simple preparation yielding bold flavor. Soft Shells get a dusting of Cajun spiced flour, I add 20% corn meal for additional crunch. Pan fry in butter with just a hint of olive oil to raise the burn point. Pan sauce with small amount of water plus juice and grated rind from a couple of limes. Asparagus, tomatoes, Red Hen bread and a bottle of Rose complete one of my wife and my favorite meals. That looks soooo good. I cannot think of a better way to start off the summer season. Lovely piece, great pix, lots o' envy here. We never see soft-shells here--altho' we're just this minute back from marché Jean-Talon where lots and lots of fresh Canadian lobsters are just hitting the new season's mkt. But no soft-shells. Those look damn fine! Did you incorporate any of that fresh wasabi into your pan sauce? Geo wrote: We never see soft-shells here--altho' we're just this minute back from marché Jean-Talon where lots and lots of fresh Canadian lobsters are just hitting the new season's mkt. But no soft-shells. Tomatoes are hydroponic, tasty, but lacking depth of flavor. Dirk's sells a few high quality non seafood items, the asparagus and Red Hen bread was purchased there as well. "lots and lots of fresh Canadian lobsters " marché Jean-Talon marché Jean-Talon is high on my Montreal must list. Went to Sea Ranch in Wilmette today at lunch and bought 4 softshell crabs for $4.49 each. Cooked them According to Gary's Reverend Andy's recipe. We had these tonight with a pound of cooked, chilled shrimp from Sam's Club, salad, and some yellow rice. The kids liked them too much. I was hoping they would leave more for me. Ahhhh, man, you're KILLIN' us out here in non-soft-shell-crab country! Ouchhh! Lovely pic tho', simply lovely! imsscott wrote: Went to Sea Ranch in Wilmette today at lunch and bought 4 softshell crabs for $4.49 each. Cooked them According to Gary's Reverend Andy's recipe. imsscott inspired me. Picked up green and purple asparagus from Green City Market, a few soft shells from Dirk's and made a pot of brown rice. 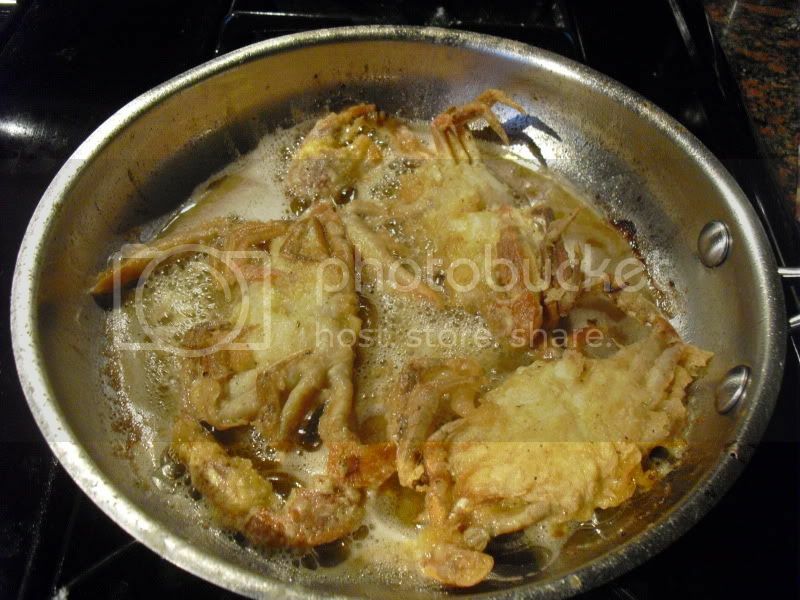 Ronnie_S's Soft shell crabs 2009 - who's making them? notwithstanding, best place to eat soft shell crab is one's own kitchen. First 2010 sighting (of mine) of an ad for live soft-shell crab: today's Sunset Foods flier. Doesn't say the price, just says they've got 'em. Katie wrote: First 2010 sighting (of mine) of an ad for live soft-shell crab: today's Sunset Foods flier. Doesn't say the price, just says they've got 'em. I got two at Dirk's today, they were $6 each. At that price, it's a good thing my husband and daughter don't like crab-- they had oil-poached salmon. that sandwich, and crab look great. I misremembered the text of the Sunset ad. It doesn't say we've got them, it says we clean them. I'm hopping over today to check out the price and get one or two for a trial run at Reverend Andy's recipe. Does anyone know if H-Mart or places around Argyle carry soft shell crabs? I know it's early in the season, but was wondering if people have seen them at any of these places in the past. After reading the posts here I had to finally try making some soft shell crabs myself so I schlepped on over to Dirks in this less than stellar weather and picked up three of the little guys. 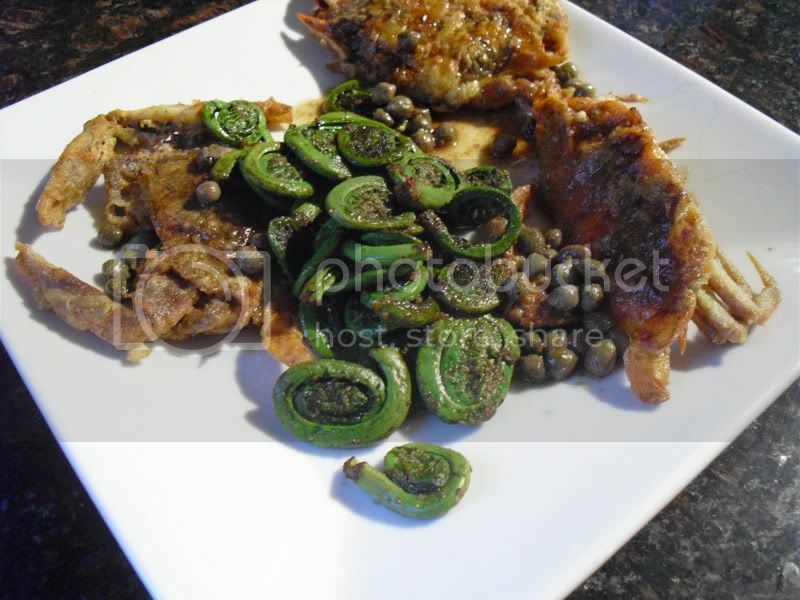 While I was there I picked up some fiddlehead ferns and decieded to have a "Things Bella has never cooked before" day. Dirk's was very busy, so I didn't really have the opportunity to get a true run down on cooking suggestions for either item, so I just did a quick Youtube tutorial, and went at it. I dipped the cleaned crab in egg and then dredged it in a flour, Chesapeake Bay Seasoning, salt and fresh ground pepper seasoning. I heated a little corn oil, and then dropped them in. Little did I know that the darn things would explode and give me nice grease burns on my face and arms (note to self, always use a protective screen). They cooked for a few minutes to a nice golden brown and I turned them over, cooking them another couple of minutes, before placing them on a paper bag to drain. 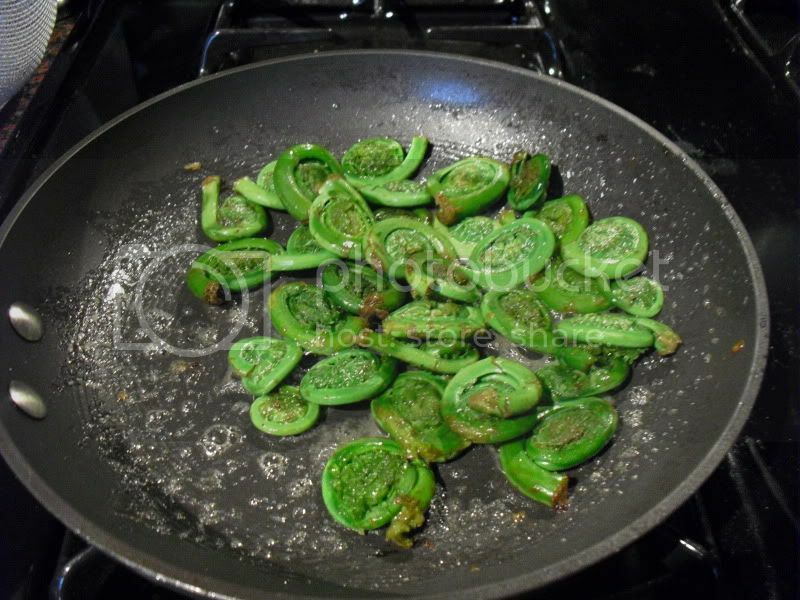 The fiddleheads were cooked in bacon fat (of which I keep an embarrassingly increasingly large stock of in the fridge) and butter. I sauteed them for a few minutes before adding a bit of beef stock and then sauteed them for about 30 more seconds before taking them out of the pan and plating them. I used the bits left in the crab pan and deglazed with a little butter, lemon and caper. Cooked it out for a minute and topped everything on the plate. This was "Oh My Gosh" deliciousness, and not too bad for a first timer.